You CAN Go Home Again!!! Warner Bros. nationwide promotion for the 75th Anniversary Blu-Ray HD release of our beloved classic yields an unexpected treat for young and old – a one-week only theatrical run in IMAX theaters – in 3-D! 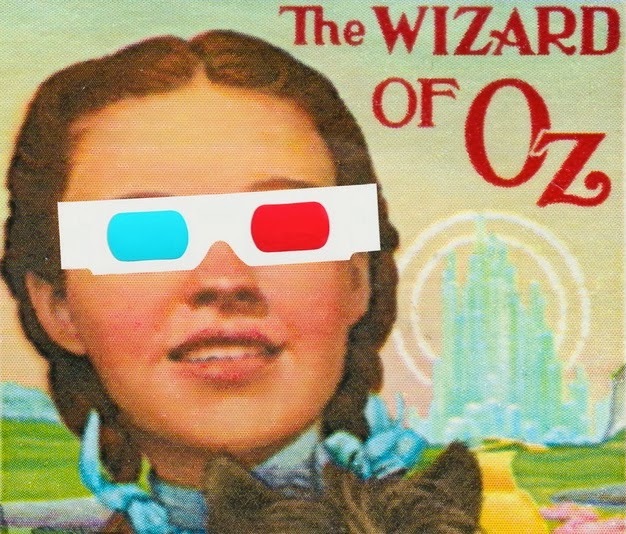 The Wizard of Oz is the oldest film to get a 3-D makeover. It took 1,000 artists and technicians 16 months to complete. Now we can all be transported into our favorite old-fashioned storybook tale via new technology! Made in 1939, The Wizard of Oz was among the first wave of Technicolor films. When Dorothy opens the door of her bleak Kansas farmhouse, the dreamland of Oz dazzles in every color of the rainbow. The film was made using 3-Strip Technicolor. In fact, the originally silver slippers in the book version were changed to ruby slippers, to take advantage of this fabulous new color process. 3 Strip Technicolor used three different strips of film running through the same camera at once. This used 3x the film stock as regular black and white film, and was complicated and expensive. The film stock was monochromatic, and the camera used a beam splitter and colored filters to send all of the RED light to one strip of film, GREEN light to another strip, and BLUE light to the final strip. The result was three strips of black and white film with slightly different exposures of the same image, based on the color of the original scene. The three black and white strips were then tinted. The RED strip was tinted CYAN, the GREEN strip was tinted MAGENTA, and the BLUE strip was tinted YELLOW. One at a time these strips were physically pressed onto a single strip of clear print stock, and the dyes imbedded in the gelatin of the final positive film. Making the final print was an entirely mechanical process, not a photographic one. There were no photosensitive chemicals used at all. The film was physically pressed together. Pressing the CYAN, MAGNENTA, and YELLOW dyes together, made the vibrant, glorious Technicolor image we know today. The Technicolor process utilized slow film and required lots of light. This was an asset to the 3-D conversion of Oz. Oz was not a box office hit when it was released, but after CBS Television began yearly broadcasts of the film in 1956, its audience multiplied into the billions. The Oz film was made by MGM to surpass Disney’s spectacular fantasy Snow White and the Seven Dwarfs, and to possibly garner some Academy Awards for the studio. It only won two; for best song, score and a special juvenile Oscar to Judy Garland. Oz was nominated Best Picture, but lost to Gone With the Wind. With its $2 million budget, it was an important ‘prestige picture’ for MGM, but was not intended to make money. It took 20 years to recoup its budget, and did not initially get good reviews. In 1998, to celebrate the very first digital 60th Anniversary restoration, Oz was shown at the venue of its very first premiere, Grauman’s Chinese Theatre in its original 1.37:1 Academy full-screen aspect ratio. This was the standard AR in the post silent movie era. (It did not go wide-screen until the 1955 re-release). It was amazing to see Oz in its original format, retaining its warm retro celluloid ambience, yet beautifully restored. With the advent of television, the cinema industry worried that people would just stay home to watch movies, so theaters began showing wide-screen format films. The film is already an eye-candy overload. But now, in its 75th Anniversary 3-D IMAX release, the plastic paradise of Oz bursts into hyper-reality! The special effects were utterly ingenious for the time, and now we see details and nuances that took all kinds of brilliant artists and craftsmen many hours to achieve. With 600 actors and 1,000 costumes, conditions were hazardous, makeup was poisonous and there were several injuries to the actors. Oz is truly an animated film using live actors. The main camera is constantly moving – ‘floating’ around the huge elaborate stage sets, giving dimension, breadth and tremendous scope. This was a bonus for the 3-D restoration, which retains the spirit of the film. With newly enhanced depth, we become totally immersed in the illusions. Rotoscoping, an animation technique was used in the 3-D conversion process. Roto achieves more lifelike animation by tracing film footage of human movement. Rotoscoping was invented by Max Fleischer in 1915 and used in his early iconic cartoon ‘Out of the Inkwell’ to create the character Koko the Clown. The technique was also used by Fleischer in his 1930s Betty Boop cartoons, notably for the Cab Calloway dance sequences. It was also used to animate Gulliver’s Travels, and early Superman cartoons. At the time, the rotoscope was mainly used to study human and animal motion, rather than tracing. It was prominently used in The Beatles film Yellow Submarine, especially during ‘Lucy In the Sky With Diamonds’. The 1980s music video ‘Take On Me’ by the band ‘a-ha’ is another memorable example. The iconic glowing light saber effect in the three original Star Wars films also used the technique. Nowadays the rotoscope machine has been replicated by computer applications. Oz Oz had been re-mastered from different prints for seven previous home video releases, but there has never been a digital restoration using the original negatives until now. Each original frame from The Wizard of Oz was scanned, cleaned, color corrected, and measured for proper 3-D spatial relations. Objects and characters in the film were isolated to enhance depth and contrast. The film is not in wide-screen format. It is closer to its original aspect ratio (a standard IMAX screen is 72 ft × 52.8 ft.). Technical enhancements in Kansas are moderate, keeping in context with the bleak sepia toned landscape. This is provides contrast for the color portion of the film to really pop big-time! The vast panoramas of Kansas are greatly expanded. The twister and its rumbling impending moments are extremely ominous, as everyone scurries for cover. The re-mastered sound is crisp refreshing – the loud bits are louder, and the silence is quieter. All of the musical scenes sound bright and new. THE HOUSE BEGAN TO PITCH! Dorothy sees an array of characters flying past her bedroom window during the cyclone, with their own signature tunes accompanying them. As Miss Gulch transforms into a Wicked Witch while riding her bicycle, a shimmer emits from her shoes – she’s wearing the Ruby Slippers! This means that she is the Wicked Witch of the East, who is killed when Dorothy’s house falls on her. Margaret Hamilton has never been credited for this cameo role. WHO, ME? I’M NOT A WITCH AT ALL! As Dorothy steps into her colorful dream world, her deep red hair is soft and lustrous. We can see her freckles! Her sincere and innocent expressions of emotion and frightful wonder are amplified as she steps into Oz for the first time. Plastic flowers glisten and shimmer. The camera moves very slowly around as Dorothy takes it all in. All elements of nature in Oz are obviously created to look fantastic – painted sets, plastic foliage – yet there is a strange reality about them. Every scene springs to life, and YOU ARE THERE! The fairytale begins as Glinda’s bubble glides down from the sky. A soft vision in pink, her lace sequined gown with its winged sleeves floats about her, and the dangling ornaments of her crown shimmer and bounce as she moves. Her sweet voice calms Dorothy’s fears, and welcomes her to Oz. Who ever thought that the Wicked Witch of the West could possibly look more frightening? Now, she is bigger, greener and meaner than ever! Her angular features seem exaggerated; elongated fingers and nose, hairy mole, long neon green fingernails and an enhanced hat! Her skin glows in electric green against her black clothing. We can almost feel the heat during the Witch’s sweeping entrances and exits in bursts of flame. We can almost smell the sulfur! In the 3-D version, the Witch pops out of the screen most often. In the shots where she is directly looking into the camera, she is literally ‘in your face’! The Witch’s total on-screen time is 12 minutes, yet she remains ingrained in our minds forever. Although most of us are probably older now than Margaret Hamilton was (37) when she played the Wicked Witch of the West, we are just as afraid as when we were little kids cowering behind our pillows. Any child who sees this 3-D version will likely be scarred for life! A wild parade of Munchkins ensues. Ponies with golden hoofs pull the Munchkins’ chariot during the celebration of the death of the Wicked Witch. The Coroner and Mayor joyfully ascertain her death. Dorothy starts her journey to Oz at the swirling end of the Yellow Brick Road, which seems elongated and looks undeniably magical, taking us even further away from our own reality. It looks more like the Yellow Brick Highway! THE SLIPPERS – YES, THE SLIPPERS! The first blinding close-up of the radiating, pristine ruby slippers (before the feet recoil under Dorothy’s fallen house) is stunning. Five known pairs of ruby slippers (quite possibly more) were made for Judy and for her stand-in, but this is the perfect pair. These shoes were used exclusively in close-up shots. This pair did not have felt on the bottom (as the others did – to quiet Dorothy’s steps while dancing down the yellow brick road). The pristine pair of Ruby Slippers was purchased (with donations from Leonardo DiCaprio and Steven Spielberg, and others), for over $1 million in 2012 by the Academy of Motion Picture Arts and Sciences for the film museum it is developing with LACMA. The Ruby Slippers, the most iconic image in movie history, ooze with magical powers and steal the show! They sparkle and reflect like never before against the Yellow Brick Road / the shiny deep green floors of Emerald City. When the witch tries in vain to remove them from Dorothy’s feet, we are more frightened than ever. The huge electrifying yellow spark (actually dark apple juice spewing out of the shoes – the film was sped up to make it look like fire) flies right off the screen. Zzzzzzzzzzzzz! Dorothy radiates innocence in her pale blue gingham glory and freckled face. Tears often well up in her eyes, and her moments of laughter are infectious. Even in sepia, she glows. Scarecrow is a joy to behold. It’s no wonder the crows are unafraid of him. His expressive wrinkled textured burlap face is charming. We can see the strands of loose straw stuffing of his patched costume (now on permanent exhibit in the Smithsonian). He walks on air with his rubber legs. A familiar endearing character has come back to us, looking wonderful, fresh, and ever so tangible. Our dear Lion is virtually a living creature. Here is a reversal where something real looks animated. (Bert Lahr’s 90-pound costume was an actual lion pelt). The texture and motion of his costume is astounding. You want to reach out and pet him as he wrestles with his unmanageable tail that he is always grabbing with his clumsy paws. The hardest working cast member and unsung hero of the film, Toto connects all the key plots. By chasing a cat, he saves Dorothy from going off into oblivion with the Wizard in his balloon after exposing the Humbug. Now Toto is ready for his close-up, more prominently visible, always at our feet. The Haunted Forest scenes have the most depth and dimension. It’s like being in an actual haunted house! We are literally immersed in the woods, pelted by apples thrown by the grouchy talking haunted trees. Scarecrow waves his gun, and Lion wields his Witch Remover. Multitudes of Winged Monkeys and their commander Nikko swoop down and terrorize. The Poppy Field is sumptuous, surreal and saturated with color. (Tin Man and Scarecrow are not affected by the opium, as they are not mammals. Dorothy, Lion and Toto succumb.) The fake snow looks like REALISTIC fake snow falling all around us when Glinda, who appears to arise from the screen right amongst us in holographic form, breaks the spell, and we’re skipping off to Emerald City. Now I know what it feels like to be on an acid trip! There is a brief clear glimpse of the magical Golden Cap: after Dorothy and the Lion reawake from the poppy field spell, the witch watches them in her crystal ball. Nikko hands her the Golden Cap and she utters “somebody always helps that girl”, before throwing the cap across the room angrily. This comes from a scene deleted from the final film. The tubular Space-Age / Art Deco façade of Emerald City is gorgeous! I never realized there were so many shades of green, all used in the costumes of the rosy-cheeked denizens of Oz. There are too many amazing details to mention in the Oz salon where Dorothy gets a glam makeover, Lion gets perm, Tin Man gets buffed, Scarecrow gets stuffed and Toto gets fluffed. Lion’s song, ‘If I were King of the Forest’, is truly regal with his flowerpot crown and emerald cape. The long hallway leading to the creepy Wizard Head avatar is noticeably extended and scarier – especially when Lion runs away in terror and crashes through the window. Ominous mountains and cliffs surrounding the Witch’s castle stretch farther and wider. It’s really creepy in the castle! The witch’s accouterments are accurately translated as either concave or convex – such as the Crystal Ball, and the Hourglass (which has several ginormous close-ups!) The red grains of sand fall terrifyingly fast as Dorothy cowers in a corner. The Witch’s marching and chanting minions, the Flying Monkeys and the Winkies are resplendent in their matching red and gray outfits and blue/green faces. A guy coming out of the previous showing came right up to me and said, “I hate to spoil it for you, but they melt her in the end!” Ha ha – the melting scene was spectacular! The ‘Wizard’ appoints Scarecrow, Lion and Tin Man as the new rulers of Oz. There are more sublime close-ups of their faces as Dorothy says goodbye to all. Then with the infamous click of her heels and dizzying swirls from Glinda’s wand, she goes home. Toto too. They return to sepia – to a quieter, safer place. But in the end, the message is not just about home. The story tells us that we have the power to save ourselves, mentally, emotionally and physically. It’s a shame that all the hard work to achieve this masterpiece results in a one-week only experience. 3-D IMAX Oz should be shown in every theatre in the world during the holiday season, so that everyone can experience it over and over again. (Auntie Em and Uncle Henry are the only characters from the Kansas sequences not to have true alter ego characters in the Land Of Oz). Throughout the 1950s, Clara Blandick started going blind and suffered from severe arthritis. On April 15, 1962, she returned home from Palm Sunday services at her church in Los Angeles. She rearranged her room, placed her favorite photos/memorabilia in prominent places. She laid out her resume and a collection of press clippings from her lengthy career. She dressed immaculately, in an elegant royal blue dressing gown. Then, with her hair properly styled, she took an overdose of sleeping pills. She lay down on a couch, covered herself with a gold blanket over her shoulders, and tied a plastic bag over her head. Clara left the following note: “I am now about to make the great adventure. I cannot endure this agonizing pain any longer. It is all over my body. Neither can I face the impending blindness. I pray the Lord my soul to take. Amen.” Her landlady found her body Sunday morning. Died in California in 1956 at age 86, never knowing of the legendary film’s wild success. On June 22, 1969, Garland was found dead by her husband in the bathroom of their rented house in Chelsea, London. She died of an overdose of barbituates at age 47. 20,000 people paid their respects at her New York City funeral. Bolger died of cancer in January 1987 in Los Angeles, just after his 83rd birthday. At the time of his death, he was the last surviving main cast member of The Wizard of Oz. Died of a heart attack the age of 80 in June 1979 in Los Angeles. A short time previously, he had appeared at the Academy Awards ceremony with Ray Bolger, the Scarecrow. Haley was still active until a week before his death. His son, Jack Haley Jr. married Judy Garland’s daughter, Liza Minelli in 1974. The Vaudevillian actor died of cancer in December 1967 at age 72. During the 1960s and 1970s, Hamilton appeared regularly on television. She was a Mystery Guest the popular Sunday Night CBS-TV program What’s My Line?. She played Morticia Addams’ mother, Hester Frump, in three episodes of The Addams Family (1965–1966). (Hamilton turned down the role of Grandmama.) Appeared on Sesame Street as the Witch in 1976, and was Cora in the popular Maxwell House coffee commercials. Died in her sleep following a heart attack in May 1985, at home in Connecticut. Died in 1970 at age 85. She is buried with her husband, famous showman husband, Florenz Ziegfeld (Broadway impresario of the Ziegfeld Follies). Died @ age 59 in 1949 prior to film’s success. Assorted groups of munchkins appeared together and participated in many Oz events over the decades. Only two of 135 munchkins are still living. Margaret Pellegrini’s recent death in August 2013 at age 89 leaves just two remaining Munchkins, Ruth Duccini, 95 and Jerry Maren, 93. Maren also appeared in Our Gang comedies, and was the McDonalds Hamburglar & Mayor McCheese. Toto’s real name was Terry. During the course of the film, her owner and trainer changed her official name to Toto. The Cairn Terrier earned more than the Munchkins did ($125 per week). She appeared in 13 films. When Toto died in 1945, she was buried at her owner’s ranch in Studio City, CA. However, the construction of the Ventura Freeway in 1958 destroyed her resting place. In 2011 a permanent memorial for Terry was dedicated at the Hollywood Forever Cemetery in Los Angeles. The coat that Frank Morgan wore in his role as Professor Marvel (coincidentally hand-picked by MGM from a second-hand clothing rack) once belonged to the Oz books author L. Frank Baum. The inside pocket bore his initials. After completion of the film, the coat was presented to Baum’s widow and his personal tailor, who both confirmed that it was indeed belonged to the author. 1949 (10th anniversary) through 1959, the film was shown with the Kansas scenes in black and white, rather than the intended sepia tone. 1955 – Theatrically released in wide-screen format. 1986 – The film was acquired by Turner Entertainment, which then merged with Warner Bros.
1999 – 60th anniversary Warner Bros. DVD restored version. Shown in IMAX theaters in 3-D.